Ry took a couple extra days off for Thanksgiving, and we enjoyed some nice, relaxing "alone" time together. 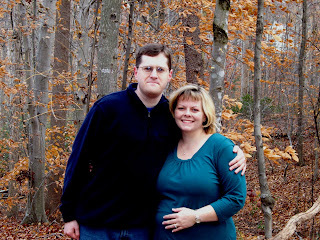 It's hard to appreciate how different things are going to be for us once Baby Tess arrives. We're used to alone time--we've had 7 years of it! But I think we're ready for the change. I'm still debating whether or not I want to go through the hassle of putting up and taking down the Christmas tree this year (though I've been called a scrooge for not wanting to do it). I did make us stockings though; we'll see if I can muster up the holiday spirit to do any more decorating. My sister-in-law Laura sent out a bunch of super-cute baby clothes, including these precious dresses (they make my heart melt!). I can't wait to get the baby here! 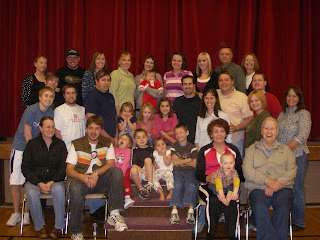 And finally, a picture of my family from this year's annual Christmas party. What a cute group--makes me a little homesick! We had a really nice Thanksgiving Day with Ryan's parents. Ryan's cousin Jake and his wife Michelle came down with their three girls (Brie, Megan and Rachel) from New Jersey to spend the holiday. Wendy also invited a couple from their ward to join us for dinner. Their two little boys helped liven the party. Dinner, of course, was delish. Though the curse of the "Holidays from Heck" tried to rear its ugly head, the collateral damage was limited to a broken kitchen spigot and a particularly off-tasting Williams Sonoma gravy (not recommended). The turkey wasn't the only thing broiling, since we had temperatures in the mid-70's until after dinner. Then a big storm front rolled in with gusty winds that cooled things off considerably. The kids had fun outside trying to catch leaves that were falling from the sky like snow. Rachel was tickled to be caught up in a "leaf tornado." In all, we have lots to be thankful for this year. We're counting our blessings. Just a few pics of local color for any of you who might be deprived this time of year. 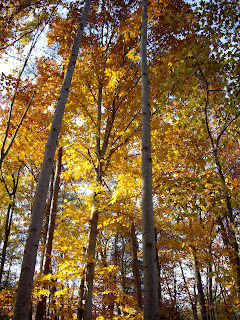 I love fall in Virginia--there's just nothing better! 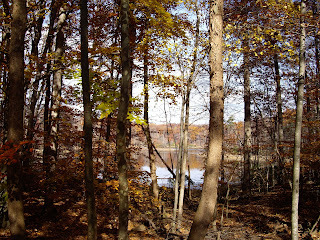 These are from the Occoquan River, just around the bend from our house. 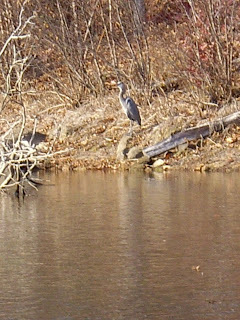 Dad, the heron pic is for you (he was trying to blend in clear over on the other side of water). The hospital I have to deliver at is about 45 mins. away in good traffic (which practically never happens, and yes, we pass two other hospitals on the way), so I've been most nervous just about getting to the hospital in the first place. Hopefully the baby won't come any earlier, and I'll be able to deliver in a planned, controlled environment (as opposed to, say, on the side of I-95). 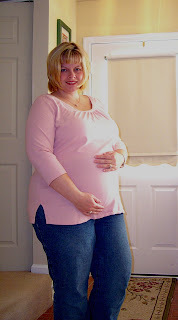 The only downside is that Mom won't be out until Dec. 20th--but at least we know the baby will be here for Mom's visit. Whew! Yes, that is the momentous sound of the Higginbothams being launched into the 21st century. With considerable urging from many of you, we decided to join the rest of modern society and get a digital camera (thanks for the early Christmas present, Mom and Dad!). And since we will soon have someone worth taking pictures of, I thought I'd try my hand at blogging. I can't promise anything as fancy as my sisters' blogs, but I'll do my best! We've been busy preparing for our upcoming arrival. Assuming the name fits once we actually see her, we plan to name her Tess Emmeline Higginbotham. Tess is scheduled to arrive any time around Christmas. Her original due date was December 21st, but since she's measuring a little small, the doctor has pushed it back to December 26th. Anyone else have the same sinking feeling that she's going to aim for the 25th? 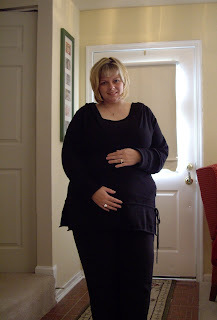 The pregnancy has been going smoothly, and it actually has been pretty easy on me. Tess weighs about 5 lbs. now. We've had several ultrasounds, but we never get very good pictures out of them. Here is an ultrasound shot of her foot--that's the most recognizable bit of anatomy I've been able to pick up on. We do have some less exciting shots of her femur, arm bone, and kind of creepy skeletal face view. I mean, I'm glad she has all these things; I just hope she's born with skin. 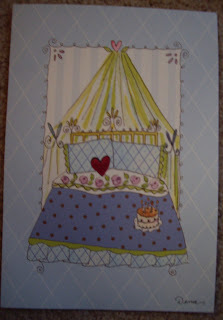 The nursery is all ready for Baby Tess. Nana Wendy helped us get some really nice furniture for her room (thank you! ), and Grandma Dipsy (I suppose it's inevitable that name will stick, huh?) bravely helped implement my design ideas. I got the idea for the lattice wall from a card that Ryan gave me a couple years ago. We were nervous about how it would turn out, but I love it. Since I stopped subbing a couple weeks ago (too exhausting, not to mention too many germy kids around), I've been quite domestic. Not doing anything really useful like cleaning the bathroom or doing laundry, but I've been doing a lot of sewing with fun fabrics. Let's just say that if we ever want to reinact "Princess and the Pea" with Little Tess, we'll have plenty of baby blankets to use as props. Here are four darling blankets my mom made for the baby (though I have to confess to stealing a few snuggles with them myself!). I guess it's good that she'll be kept warm--when I told one of my Primary kids that the baby would be born at Christmas time, her concerned response was, "Ooh! Your baby is going to be cold!" Yes, we'll probably have to put clothes on her. Since Dad was in town for work, we got to go out for dinner with him last night. It was fun to see him and talk for a while, even though our visit was brief. Am I my Dad's daughter, or what? 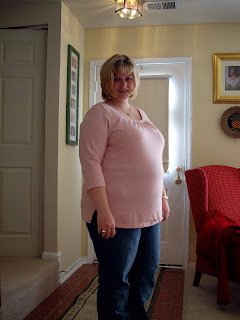 And for the begging sisters, here are a few preggo pics of me. The first one is from October (during Mom's trip) and the last ones are the most recent--I'm almost in my 9th month!